People’s cellphone use has injected itself into public spaces. This has blurred the line between private and public as often-intimate and occasionally blustering phone conversations have now become a common part of the background noise during bus rides, grocery shopping excursions, picnics, sidewalk strolls, waits in airport terminals and many other public venues. To see how people are responding to these changes, people were asked about their views on general cellphone etiquette in public. About three-quarters of all adults, including those who do not use cellphones, say that it is “generally OK” to use cellphones in unavoidably public areas, such as when walking down the street, while on public transportation or while waiting in line. At the same time, the majority of Americans do not think it is generally acceptable to use cellphones in restaurants or at family dinners. Most also oppose cellphone use in meetings, places where others are usually quiet (such as a movie theater), or at church or worship service. It is important to note that the survey did not specify what “using a cellphone” meant, and so the question was open to interpretation. It is possible that people who use their phones more often and in more diverse ways may have wider definition of what “cellphone use” entails, including less intrusive or more social activities such as sending a text message, checking email or taking a photo. Clearly, less frequent users and non-users may more strongly associate the idea of “cell use” with voice calls, which may be seen as more disruptive. Roughly three-quarters (77%) of Americans say that it is “generally OK” to use a phone while walking down the street, and men are slightly more likely than women to say that cellphone use in this situation is acceptable (80% vs. 74%). Notably, this is the only activity for which young adults ages 18 to 29 are not necessarily more accepting than older age groups. Some 78% of young adults ages 18 to 29 say that using a phone while walking down the street is generally OK, while 82% of those ages 30 to 49 also say this. 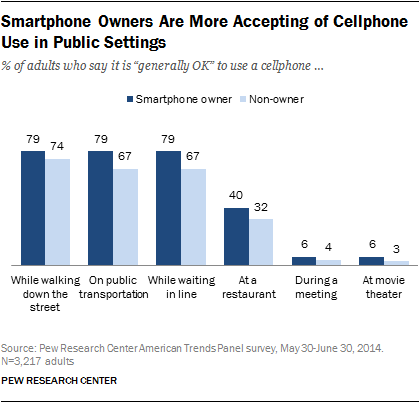 Three-quarters (75%) of Americans say that it is generally OK to use a cellphone on public transportation. Men (79%) are more likely than women (71%) to say this was generally OK. Public transportation is one of the situations in which younger age groups are much more likely to say phone use is acceptable, compared with older adults: 90% of young adults ages 18 to 29 say that it is generally OK to use a cellphone on public transportation vs. 54% of those ages 65 and older. Some 74% of Americans say it is generally acceptable to use a cellphone while waiting in line. 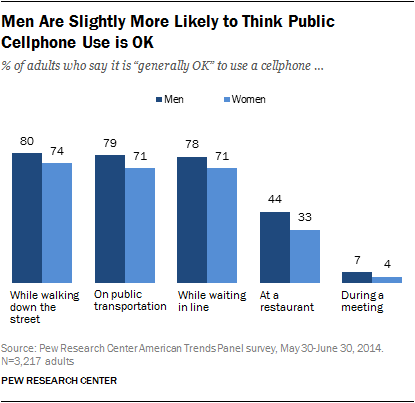 Men (78%) are somewhat more likely than women (71%) to say it is generally OK to use a cellphone in this situation. Some 38% of Americans say that it is generally OK to use a phone at a restaurant. Men (44%) are more likely than women (33%) to say it is generally OK to use a cellphone in this situation. This is another situation in which younger age groups are much more likely to say phone use is acceptable relative to older adults: Though 50% of young adults say it is generally acceptable to use cellphones at a restaurant, less than half of older adults — including just 26% of those 65 and older — say that this is generally acceptable. Overall, just 12% of Americans, including equal shares of men and women, feel that it is generally acceptable to use a cellphone at a family dinner. Some 13% of men say cell use at dinner is OK and 11% of women say this. Interestingly, people without smartphones are not especially more or less likely than smartphone owners to say it is generally OK to use one’s phone at a family dinner: 14% of regular cellphone owners and 19% of non-cellphone owners say that cell use in this situation is generally acceptable, compared with 10% of smartphone owners. For almost all of the other activities we asked about, smartphone owners are more likely to say that cellphone use in these situations is acceptable. Some 5% of Americans said that it is generally OK to use a cellphone during a meeting. Men (7%) are somewhat more likely than women (4%) to say this was generally acceptable, though few said this overall. Just 5% of Americans say that it is generally OK to use one’s phone at the movie theater or other places where others are usually quiet. 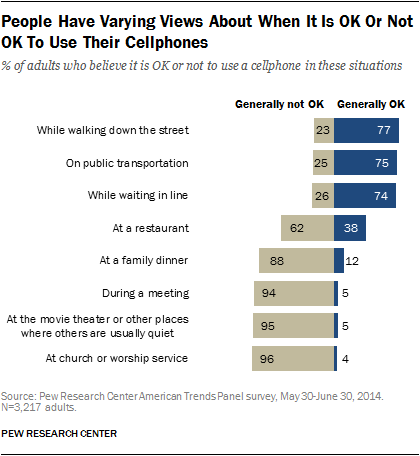 Only 4% of Americans say that it is generally acceptable to use a cell phone at church or worship service. Along with using a phone at a meeting or at a movie theater, this is one of the situations that the vast majority of Americans agree are off-limits to cellphone use. In broad strokes, Americans of all ages rank these locations similarly when it comes to cellphone usage — explicitly “public” venues are viewed as generally acceptable places to use one’s cellphone, while usage in quiet or more intimate settings is frowned upon. At the same time, younger adults are generally more permissive than their elders about cellphone use in most of these situations. As the accompanying table shows, a majority of all age groups agree that it is generally acceptable to use a phone in three general public situations: when walking down the street, while on public transportation, and while waiting in line. Using a phone at a restaurant is the only situation in our survey for which half (50%) of young adults find it generally acceptable to use a cellphone, but for which a majority of older adults consider cellphone use to be generally not acceptable. The vast majority of Americans — including young adults — do not think it is acceptable to use phones at a family dinner, during a meeting, at a movie theatre, or at church or worship service. Fully 79% of adults say they encounter loud or annoying cellphone behavior in public at least occasionally, including 30% who say they frequently encounter people acting in this way. We also asked how often people hear or see intimate details of other people’s lives while they are using their cellphone in public. Over half of Americans (53%) say they overhear such details either frequently (18%) or occasionally (35%). There are few differences between age groups or by race or ethnicity. Women (23%) are more likely than men (13%) to say they “frequently” hear these sorts of details.